Champion 2000+ Juicers have been manufactured for over 35 years, providing quality juice and food processing at an attractive price point. 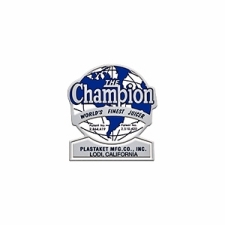 With a 10 year warranty and available parts, Champion Juicers are known to keep working for decades. The Champion 2000 Juicer is a single gear masticating juicer which chews and breaks up plant fibers at a cellular level. This gives you more quality nutrition like fiber, enzymes, vitamins and minerals. Champion juicers are designed for simplicity and ease of use, having few moving parts, the main floating cutter just slides on and locks into place. In addition to healthy and nutritious fruit and vegetable juices, Champion 2000 juicers can homogenize nut butters, fruit, sauces like apple and tomato sauces, baby foods, sorbets, ice creams, sherbets, purees, salsa, shaved ice and more. Champion Juicers have been manufactured since the 50's and are one of the most widely used, affordable and dependable juicers on the market today. With the optional greens attachment you can juice wheat grass and also sprouts and other leafy greens more effectively. With the optional grain mill attachment you can process flour, corn meal, coffee, and other grains. Champion 2000 Juicers now come in 2 colors including white, and black. Champion Juicers are a great choice if you want the flexibility to juice and process almost anything you desire. Out of the box a Champion juicer is one of the most versatile juicers on the market, and with optional attachments, the Champion Juicer can handle an incredible variety of tasks in any healthy kitchen.